Since Luxor is the starting point for the vast majority of Nile cruises and is also one of Egypt's most enchanting cities, it is a popular choice for those who wish to combine a Nile Cruise with a hotel stay. Staying in Luxor allows you to spend longer exploring the tombs of the West Bank as well as to revisit the stunning temples of Luxor and Karnak. Other attractions include the somewhat grisly but fascinating mummification museum and the atmospheric souk, the perfect place to shop for souvenirs. Luxor is also a great choice for a little pre or post cruise relaxation and an opportunity to soak up the sun. The most popular of the Nile Cruises - an itinerary which allows you to explore the treasures of Ancient Egypt with enough time to admire the views and soak up the atmosphere. After breakfast leave by coach to visit the West Bank, the land where the sun sets and the place designated as a burial ground by the ancient Egyptians. 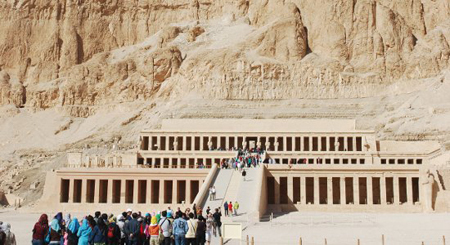 Visit two or three tombs in the Valley of the Kings and at least two more in the Valley of the Queens and marvel at the intricate murals. The tombs are open according to a system of rotation, to minimise damage caused by visitors, and there is an additional charge for visits to the Tomb of Tutankhamun and Ramses VI. Continue to the Temple of Hatshepsut, the only woman to reign as a Pharaoh, its terraces and colonnades stark against the hills, and the Colossi of Memnon, a pair of enormous statues, some 18 metres high, which once guarded the mortuary temple of Amenophis III. Lunch & afternoon tea on board. After breakfast visit to Temple of Horus, the falcon God, whose battle with his evil uncle, Seth, is told in vivid pictures inscribed on its walls. Afternoon tea and sail via Kom Ombo to Aswan. After breakfast visit the High Dam, the construction of which was finished in 1971, creating Lake Nasser, the world’s largest reservoir. See the ancient granite quarries and the Unfinished Obelisk before continuing to the Island of Philae, with its Temple of Isis, the divine mother of all the gods, set in a stunning location surrounded by water. It was relocated during the building of the High Dam. Optional excursion to Abu Simbel from £85 per person by road and £199 by airplane with its magnificent Temples dedicated to Ramses II and Queen Nefertari with their colossal statues and well-preserved reliefs. This site is all the more impressive for the fact the temples were relocated in a massive salvage operation during the building of the High Dam. Optional excursion to Sound & Light Show at the Temple of Isis at Philae. After breakfast, sail to Kom Ombo to visit the temple dedicated to the two gods, Haroeris and Sobek, the crocodile Nile god. This was a place where crocodiles used to bask in the sun, although since the building of the dam they are no longer found on this stretch of the Nile. Lunch & dinner on board. After breakfast, visit the most magnificent of the Nile temples, the stunning Temple of Karnak, constructed over a vast area during a period of some 1300 years. It incorporates three separate temple enclosures and highlights include the Great Hypostyle Hall with its gigantic pillars, and the Sacred Lake. An avenue of Sphinxes links this temple to the Temple of Luxor, the next stop on your itinerary, also dedicated to the Theban triad of the god, Amun, the ‘unseen one’, his wife Mut, goddess of the heavens and their son Khonsu. The reliefs here are remarkably clear, partly due to the fact that it lay buried under sand for thousands of years. Lunch & farewell dinner on board. Optional excursion to Sound & Light Show at Karnak Temple. Breakfast followed by disembarkation at Luxor and check into the Sofitel Karnak on the banks of the Nile. 9-14. At leisure in Luxor. 15. Return to UK on charter flight from Luxor. Please note that this itinerary is based on that followed by M.S. Nile Premium, as our boats all follow slightly different itineraries. All of the itineraries, however, do include visits to the sites listed above. If you prefer you can visit Luxor before your Nile Cruise. The price of your holiday remains the same.